A day early, due to Synod. This past week, I sat down at a coffeehouse and burned through about 100 pages of The Story of Edgar Sawtelle, and doing that really did a lot for my interest in the story. I find that I'm usually able to read only a chapter or two a night just before bed when I'm starting to drift off already. But now I'm much more invested in the book, which is exploring the details of the family keeping their dog breeding business, why it was started, why the dogs are unique. And now that the story is in full-on Hamlet mode, that piece has become very important. I watched the movie Once this week, about an Irish singer/songwriter who meets a Czech singer/songwriter and their budding relationship through music. This could almost be considered a musical, as they perform full versions of many of their songs during the course of the movie. It took a while to grow on me, I think because so many of the songs are of the lovelorn ballad variety. The single for which the two main actors won their Oscar was excellent, as were several others, but I found myself needing to be intentional about sticking with the film long enough to appreciate them. The movie isn't heavy-handed about the relationship between the two characters. Music is what draws them together to begin with, and a friendship develops from that, and yet it doesn't become a typical love story. It is a love story, but it isn't. 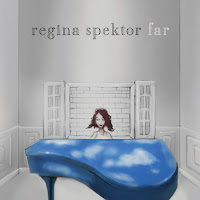 Regina Spektor's new album, Far, came out this week. She has more airy, playful sorts of songs on this album than Begin to Hope, at least in sound. "Laughing With" may be a good discussion-starter about God. "Genius Next Door" is a more melancholy-sounding tune about a guy who finds happiness of sorts in a cynical town. Her storytelling and sense of humor are sharp as they ever were, although the arrangements and style of the songs don't seem as diverse. From around the web, here's the song from Once that won an Oscar, entitled "Falling Slowly:"